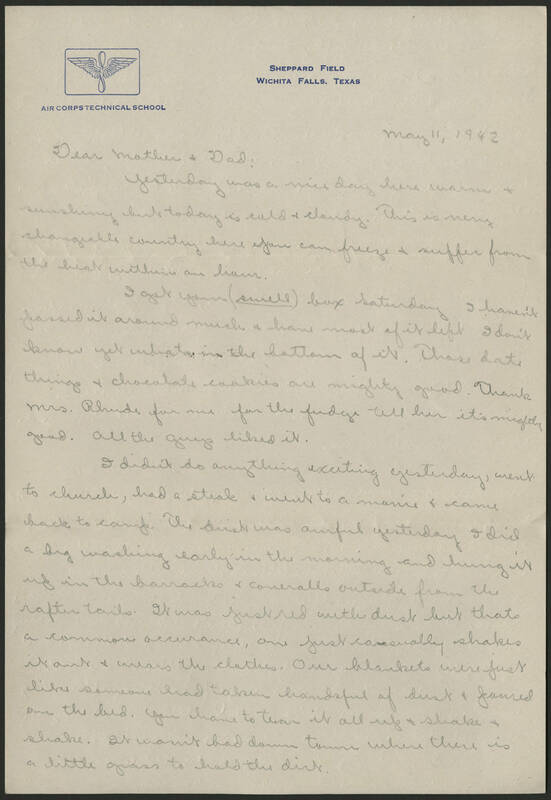 May 11, 1942 Dear Mother & Dad, Yesterday was a nice day here warm and sunshing but today is cold and cloudy. This is very changeable country here you can freeze and suffer from the heat within an hour. I got your (swell) box Saturday I haven't passed it around much and have most of it left. I don't know yet what's in the bottom of it. Those date things and chocolate cookies are mighty good. Thank Mrs. Rhuds for me for the fudge tell her it's mighty good. All the guys liked it. I didn't do anything exciting yesterday, went to church, had a steak and went to a movie and came back to camp. The dust was awful yesterday I did a big washing early in the morning and hung it up in the barracks and coveralls outside from the rafter tails. It was just red with dust but that's a common occurance, one just casually shakes it and wears the clothes. Our blankets were just like someone had taken handsful of dust and poured on the bed. You have to tear it all up and shake and shake. It wasn't bad down town where there is a little grass to hold the dirt.